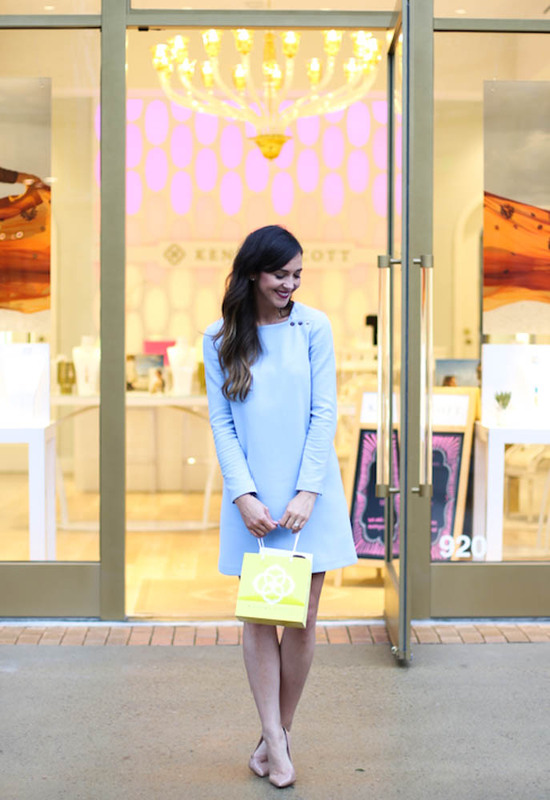 Recently Amy and I got the chance to check out the new Kendra Scott store that recently opened. I had never been inside of one of their stores and was really blown away by how pretty everything was. Their stores are designed after Kendra’s closet – which must be amazing, because if this store were my closet, I’d be one happy camper. The drawers full of jewelry, floor to ceiling full length mirrors, nail-head lounge chairs, and the lucite bar chairs at the color bar were all beautiful details that made me feel like I was playing in a dream closet. With their touch color bar screen, you can pick out whatever you want to design – a necklace, earrings, etc. Then you can chose each stone that goes into it. Once you’ve finished designing, you can sit at the color bar and watch while they make your piece right in front of you. I feel like that would be so convenient for a bride looking for specific colors for bridesmaids but also wanting each pair to be different. I loved all the pieces but thought I would get the most use out of this gold tassel necklace. I love that I can adjust the length of the necklace by tying the knot wherever I want to. It’s good for layering too. Win Win Win 🙂 I didn’t even know Kendra Scott made pieces that aren’t her colored stones – but she does. I’ve already worn this a ton. Also, for the month of October every time someone purchases a pair of these, they gift a pair to a woman with breast cancer who is undergoing chemotherapy. You even get to write a note to the woman who will receive them. Come on… that’s awesome. I hope you had a wonderful weekend – my highlight was a wedding in Raleigh. Other than that I just caught up on cleaning and errands because I’m heading to Birmingham on Wednesday for the arrival of my nephew on Thursday! I can’t wait to meet him. Thank you so much for reading and have a productive and short Monday!